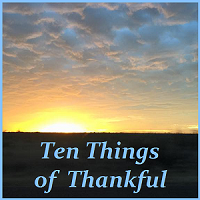 Ten Things of Thankful: Ten Things of Thankful: Spring is Here! It's nice to be able to let Tripod SissyCat outside to nibble grass and sit on the porch to watch the world go by. I bet she loves that, too! Here is where I will post mine. I will put a text link on this week's post. I'm so sorry this isn't an easier process for you!